Want a sharper more alert brain? Then here are some foods you could feed to your brain to keep it working hard and smart. These foods are top brain foods that your child would also need to help improve their problem solving ability, keep them energized, improve concentration in their classes, and even sharpen their memory. Eggs – We love them don’t we? So do our brains… eggs contain vitamin A and B, folic acid, choline (especially the egg yolk) and biotin, all are nutrients that will improve your memory. For your kids, it gives them better problem solving abilities. Blueberries – These are powerfully packed with vitamins and minerals, apart from being full of antioxidants (for heart health). These tasty and brightly colored berries sharpen memory and enhance learning capacity. Increase your blueberry intake and snack on them whenever you have the chance. 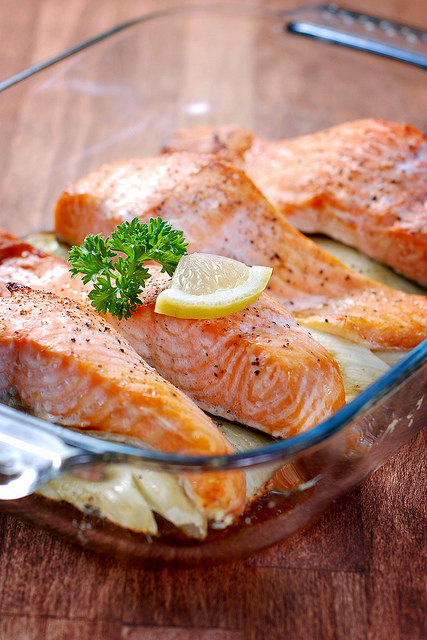 Fish – Fish contain vitamin B2 and D, zinc (particularly good for the memory), and phosphorous. The oily species such as salmon, mackerel and fresh tuna contain omega-3 fatty acids that are the brain tissue growers. They can help you absorb and remember new information. Fish also contains iodine, which will improve your mental clarity. Whole Wheat Bread –All whole grains such as oats and wheat bran are rich in vitamin B12 and B6 that will help boost your recall capacity. Beef – Maybe not for the vegetarians, but beef is a rich source of zinc, which is good for your memory. Beef helps you boost your brain function. Nuts – You can’t go nuts with nuts! Walnuts (and walnut oil), peanuts, almonds and generally all nuts are nutrient packed and contain the omega-3 fats that help you to absorb and recall information, as well as improve your memory and mental clarity. Coffee – Of course this should be taken in moderation. The caffeine in the coffee has been shown to reduce the risk of Alzheimer’s disease, as well as dementia.